The Hebrews depart Mt. Sinai and travel though the wilderness to Kadesh Barnea, in preparation to enter Canaan. Here, the people propose sending twelve spies into the land, and when Moses brings this to the Lord, He approves. Moses and Aaron fall on their faces before the congregation while Joshua and Caleb tear their clothes and run through the people, begging them not to rebel against the Lord. But the mob picks up stones to kill them. 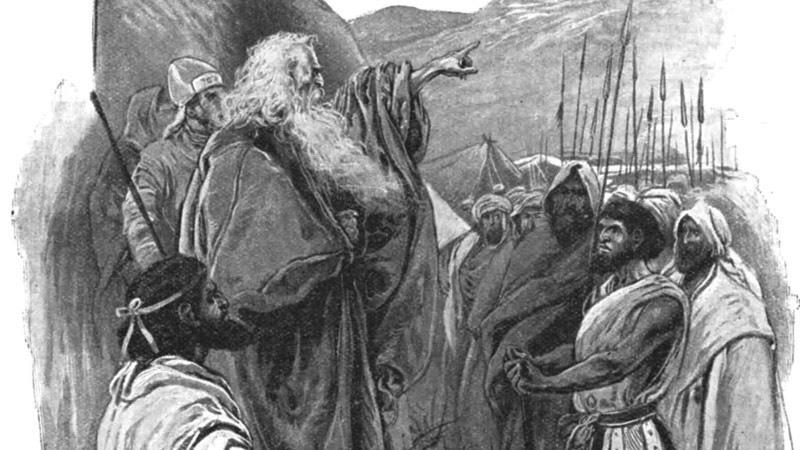 God accepts Moses’ argument, instructing him to take the people back out into the wilderness. As punishment for their rebellion, all who are 20 years and older will die there, while the younger ones will enter Canaan. Because of their apostasy, the forty days of spying become forty years in the wilderness, where they will die. The ten wicked spies die in a plague, and the people mourn deeply. The following day, they directly disobey God’s orders, and decide to enter Canaan, afterall. Moses reminds them that the Lord is not with them, and that the ark of the covenant will stay in the camp. These defiant ones go anyway, and die by the sword of the Amalekites and Canaanites. The rebellion is not over, but takes another twist when Korah, a Levite, conspires with Dathan, Abiram, and 250 leaders to organize a jealousy-based revolt against Aaron. They declare that everybody is holy, and therefore able to minister as priests within the tabernacle. Moses chastises Korah and the others, commanding them to appear with their censers at the tabernacle the next day. Then he calls for Dathan and Abiram, who refuse to even see him, making him very angry! The following day, he approaches the tents of the three ringleaders, and warns the people to step away from them. He then declares that if their accusations against him and Aaron are true, they’ll die a normal death; but if not, the ground will swallow them up. Instantly, the earth opens, and then closes over them. Meanwhile, back at the tabernacle, a fire comes out from the Lord and consumes the 250 leaders who are offering incense! The following day, the congregation accuses Moses and Aaron of killing the Lord’s people, and suddenly, the glory of the Lord reappears, and a plague begins to spread. Moses tells Aaron to grab his censer and make atonement, however, by the time he reaches the edge of the plague, 14,700 of them have died! To settle whom God chooses as priests, Moses has each tribe leader bring a rod inscribed with their name to be placed in the tabernacle. The next day, Aaron’s rod is in full bloom and has produced ripe almonds. There are many lessons in this story, but one is very clear: it is a terrible thing to rebel against the Lord, and when we do, we may become our own individual sin offering!